Guatemala, a country in Central America bordered by Mexico, Belize, Honduras, El Salvador, and the Pacific Ocean has a total land area of 42,042 square miles and a population of over 13.3 million. Guatemala is bio-diverse with mountains, small desert with sand dune patches, lowlands, coastal area and a hilly valley. Further these regions vary in climate, elevation, and landscape. The major industries are food processing and textiles. Tourism is gaining in popularity too. While the weather is generally agreeable year round peak season is December and January. Guatemala caters to varying interests of its visitors such as Mayan ruins, colonial history, volcanoes, beaches, ecotourism, rafting and fishing. Lonely Planet Guatemala 978-1741791495 $15 Includes 57 maps. 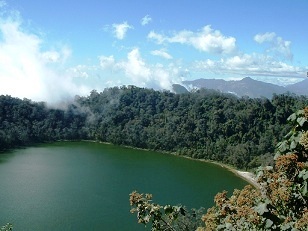 An introductory section for travelers followed by region-wise sections on Guatemala City, Antigua, The Highlands, The Pacific Slope, Central and Eastern Guatemala, and El Peten. Guatemala: A Journey Through the Land of the Maya 978-0615210582 $30 Outstanding photography and excellent writing makes this a compelling book on the people and culture of Guatemala. Guatemala Travel Map 978-1553412342 $13 1:470,000 scale. The first stamps of Guatemala were released on March 1, 1871 in the Coat of Arms theme. The set (Scott #1 to #4) of four stamps are remarkably inexpensive at around $14 mint and around $30 used. Another set of two stamps in the same theme were released in 1873. That set (Scott #5 to #6) is rare and catalogs for around $450 mint and over $100 for used. Guatemala declared independence from Spain in 1821 and gained recognition from Spain in 1850. Two other sets along with certain overprints formed the Guatemalan stamp issues during the period till 1881. Those sets (Scott #7 to #10 and #11 to#14) are both comparatively inexpensive. The most valuable pieces from the period are examples of ‘Half Used on Cover’ for a few of the issues – they catalog well into the $1000 range. The sets feature Liberty symbol, Indian woman, and quetzal. Quetzal is the national bird of Guatemala and also the name of its currency – in ancient times, quetzal bird’s tail feathers were used as currency. It is a bird in the Trogon family known for its colorful plumage and is a symbol of liberty - it is very difficult to keep it in captivity as it usually kills itself soon after being captured. Guatemala released a set of five stamps in the Quetzal theme on November 7, 1881. The set (Scott #21 to #25) catalogs for around $15 mint and $10 used. The set is noted because of the existence of a couple of inverted center errors. Those examples catalog for upwards of $400 - Scott #23a 5c red and green cataloging for around $3000 mint and around half that for used . A long set of fourteen stamps released on January 1, 1897 to mark the Central American Exposition held that year in Guatemala City. The set (Scott #60 to #73) catalogs for around $170 mint and around $190 used. The design shows National Arms and President Jose Maria Reina Barrios. Reina Barrios was President of Guatemala from 1892 to 1898 when he was assassinated. A set of two stamps released in June of 1911 showing the General Post Office and President Manuel Jose Estrada Cabrera. The set (Scott #141 to #142) is inexpensive and catalogs for less than a dollar mint or used. There are center inverted error examples of both these issues. The center invert on the General Post Office issue (#141a) is especially rare and catalogs for over $1700 mint and around $900 used. Cabrera was President of Guatemala from 1898 to 1920. A set of nine stamps released on July 19, 1935 to commemorate the 50th anniversary of the death of Justo Rufino Barrios. The set (Scott #264 to #272) catalogs for around $27 MNH and $33 used. Rufino Barrios was the architect of the “Liberal Revolution” of Guatemala that started in 1871. He had ambitions to reunite Central America, but ultimately lost his life on the battlefield in 1885. The designs show birthplace of Barrios, View of San Lorenzo, portrait of Justo Rufino Barrios along with a message, national emblem and locomotive, General Post Office, telegraph building and Barrios, military academy, National Police Headquarters, and Jorge Ubico and J.R. Barrios. Jorge Ubico was President of Guatemala from 1931 to 1944. A set of three stamps issued on April 28, 1967 showing a Map of Guatemala and British Honduras. The set (Scott #396 to #398) catalogs for around a dollar MNH or used. The set was issued to state Guatemala’s claim to British Honduras (currently Belize). Guatemala has claimed all or part of the territory of Belize and the dispute is still unresolved. A set of five stamps released on November 8, 1994 to mark the fiftieth anniversary of the October 20 Revolution. The set (Scott #463 to #467) catalogs for around $5 MNH and around $4 used. The designs show student holding book and rifle, constitution, city buildings, San Carlos University, and social security building. The first coin of Guatemala was a one-fourth Real (8 Reales = 1 Peso) Silver Coin issued in 1859. The 1859 issue is very valuable cataloging for around $2400 in XF. Prior to this, Spanish Colonial Milled Coins and certain counter-marked coinages were used. Reform Era Decimal Coinage Debut in 1925 (100 Centavos = 1 Quetzal) with the introduction of Copper Centavos. The coin along with its bronze variety issued the same year catalogs for around $40 UNC. Coins $1 and up Common UNCs starts around $1. Early 20th century silver coins in VF starts around $10. Silver proofs from the 1990s onward starts around $50. Gold coins from the 19th century starts well into the 100s. Paper Money $2 and up Polymer UNCs from the 2000s starts around $2. Recent UNC bundles starts around $30. Banknotes from the early 20th century in VF starts around $50. Recent Specimens, Proofs from the 19th century, and other rare notes go well into the 100s. Brightly colored fabrics, masks, wood work, leather, paintings and authentic coffee are the main buys of its visitors. Cultures and Ethnicities $5 and up Handcrafted brooch-pins, pouch bags etc start around $5. Native Guatemalan vintage dolls start around $10. Authentic vintage wooden folk art masks start around $25. Jadeite Maya mask carvings, polychrome Mayan Bird Bowls, etc start in the 100s. Art $20 and up 19th century art and photo prints start around $20. Original recent acrylic paintings showing Guatemalan lifestyle starts around $60 and go into the 100s depending on quality and size. Antiques $20 and up Miniature doll sets, Pintado Amano vases, etc start around $20. Malinche, Maximon, etc Masks start around $85 and go well into the 100s.